chicken | chit. chaat. chew. With the arrival of my favorite season, fall, comes unhealthy eating habits — consuming excessive amounts of Halloween candy (in particular, twix bars), obsessing over all baked goods (in particular, pumpkin pie with vanilla ice cream), and last but not least, holiday parties where all the dieting rules go out the window. During the week I do my best to make healthy choices and say no to the second glass of red wine (sometimes). This is the perfect entrance for my kale, chicken, and quinoa salad. The combination of these 3 very ingredients will leave you feeling full even though you’re technically eating a salad. It all means it will be easier to fight off those pesky cravings I mentioned earlier. 1.) 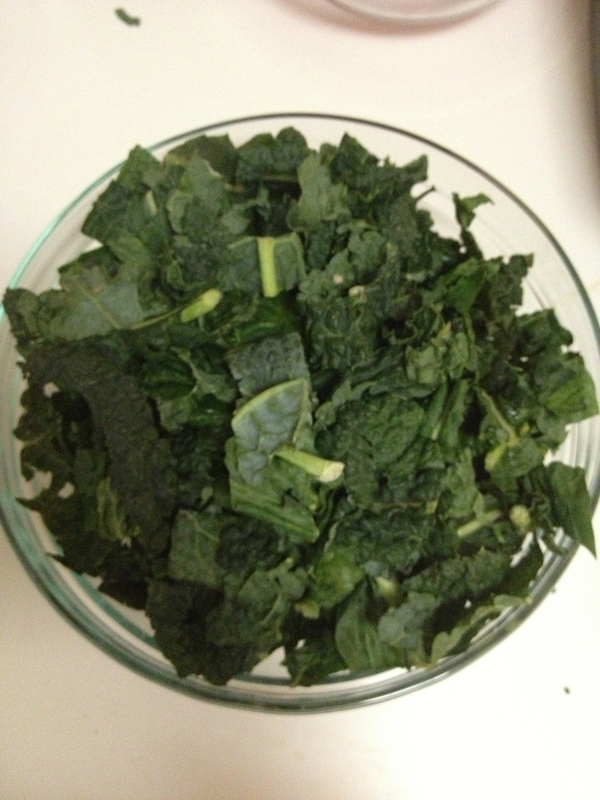 Prepare your kale by removing the center rib and chopping the leaves into bite sized pieces and place into a plastic/ceramic mixing bowl. 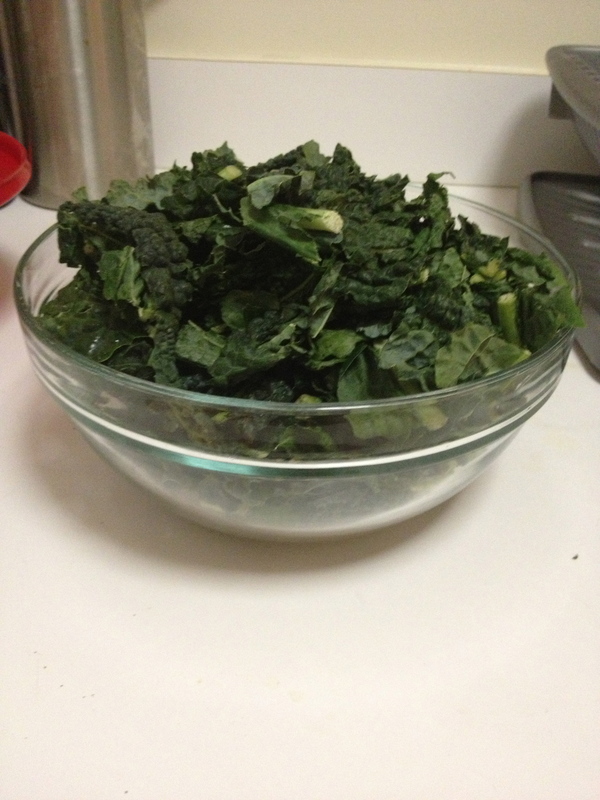 Add lemon juice, salt and pepper and gently massage the kale with your heads until he starts wilting. You may need to use the other half of your lemon. Once you are done massaging your kale, put to the side for 10-15 minutes while you prepare your dressing and salad extras. 2.) 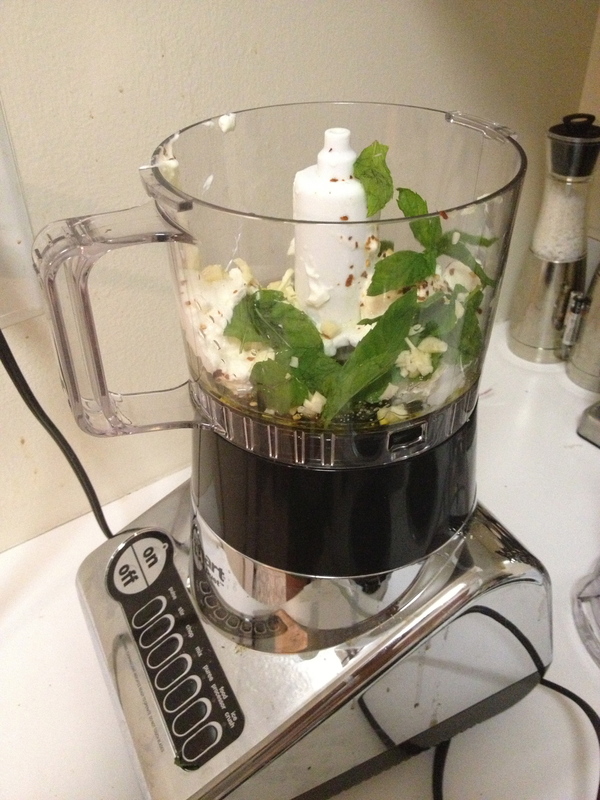 In a food processor, combine all dressing ingredients until smooth. Be sure to add additional herbs/seasonings to taste. 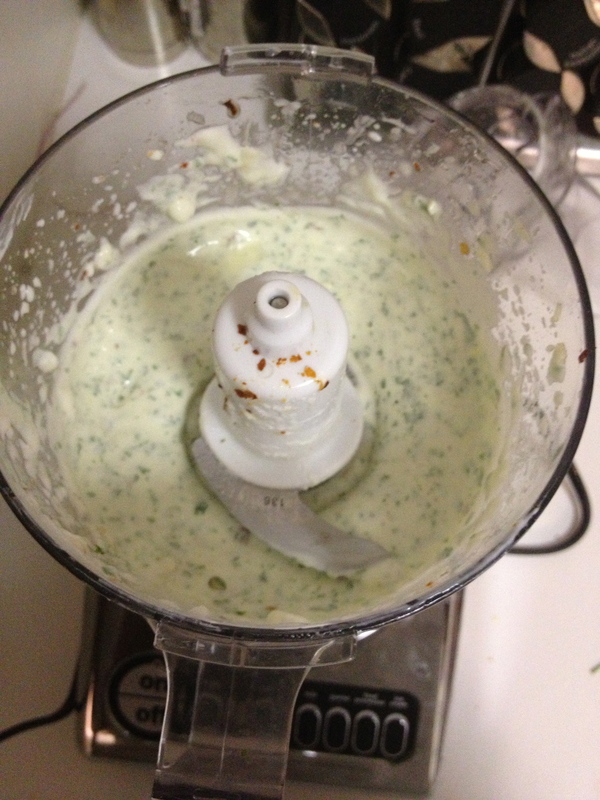 I like doubling the dressing recipe so that I can add an extra dollop to my salad, guilt-free or use it the next day as a dip for carrots, or turkey kebabs. 3.) Heat your EVOO in a pan and add your ground cuimin until you can smell its aroma. Pour this on top of your shredded chicken and add lemon juice, salt, and pepper to taste. Mix well. 4.) 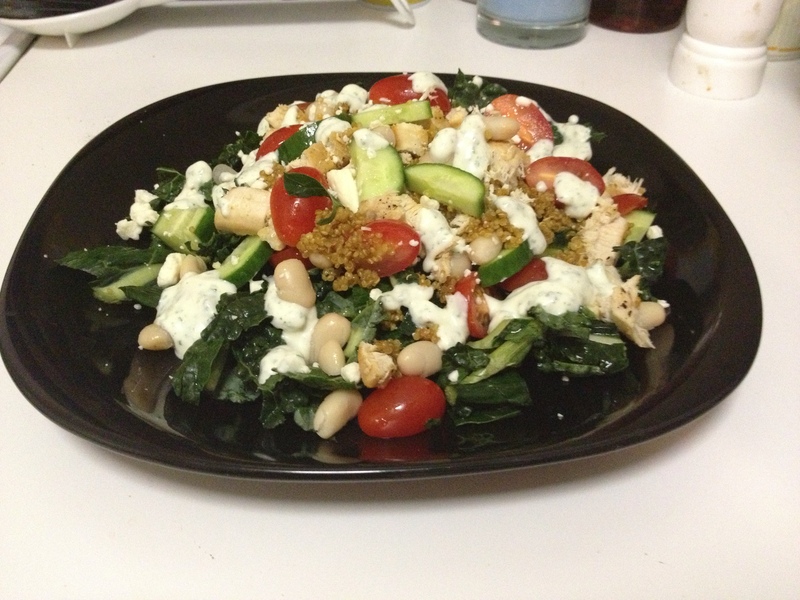 Plate your kale and each layer of salad ingredients — chicken, quinoa, garbanzo beans, cherry tomatoes, cucumbers. 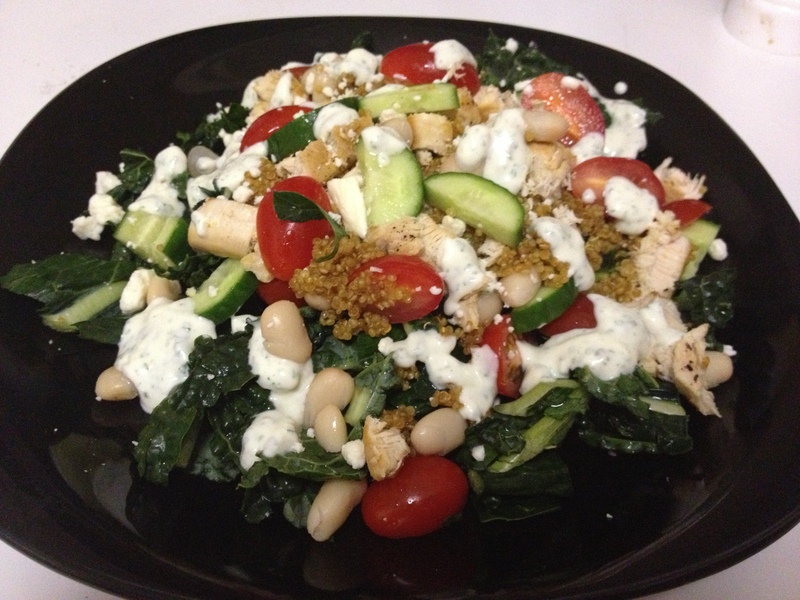 Top your salad off with your yogurt dressing and feta cheese. Have you incorporated kale into your diet? If so, what is your favorite go-to kale recipe?